Below, minimum and higher requirements are given for each performance characteristic in order to guarantee the durability of the technical performance, in respectively light and heavier areas of use (e.g. living rooms, halls, kitchens, etc….) during the whole lifetime of the MMF flooring. They are meant as a rough indication to make it easier for consumers to choose the underlay for their specific area of application and to identify and determine the suitable floor covering/underlay combinations. The underlay group required shall be specified by the floor covering supplier. If no underlay group is specified by the supplier, group 2 is recommended. as well as information on test methods and reference floor coverings, on environment and safety an on European Standards. For floor coverings with a use class (acc. EN 16205) of 31 or higher underlays are recommended which fulfill the higher requirements. The performance values must be tested according the following test methods. 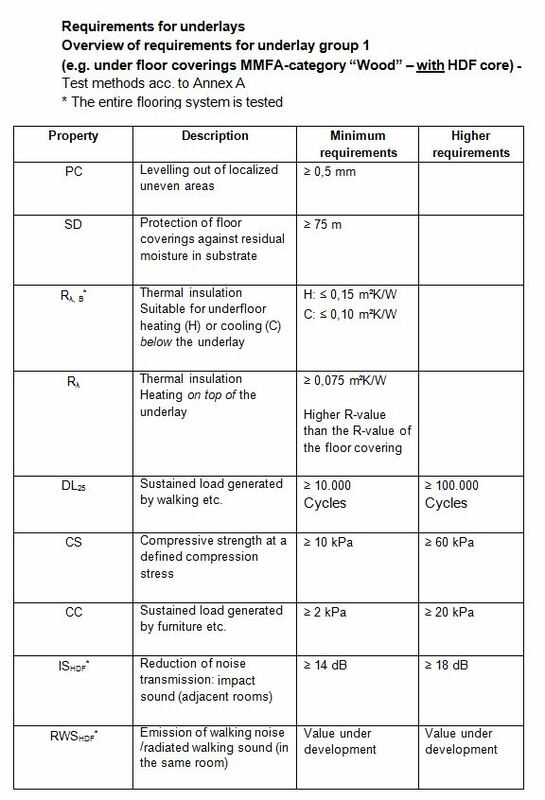 The test methods are described in EN 16354 and some are adapted to multilayer modular floor coverings as described below. For tests of underlays group 2 the applied sinusoidal load must vary between σmin = 100 Pa and σmax = 75 kPa. For underlays group 1 the reference floor covering described in A2.1 must be used as floor covering. For underlays group 2 the reference floor covering described in A2.2 must be used as floor covering. Particular properties have to be tested as a system test. In this case the entire flooring system has to be investigated. In order to be able to compare the performance of the underlay as such a reference floorcovering of the respective type of flooring should be used. The following properties may be of significance with respect to environmental and safety factors. A number of these properties are governed by national or EU legislation/building regulations. For example, in Germany a “bauaufsichtliche Zulassung (abZ)” or “general building regulations approval” is currently required for underlays dealing with VOC emissions and reaction to fire, and in France underlays have to be labeled according to specific volatile emssion categories. 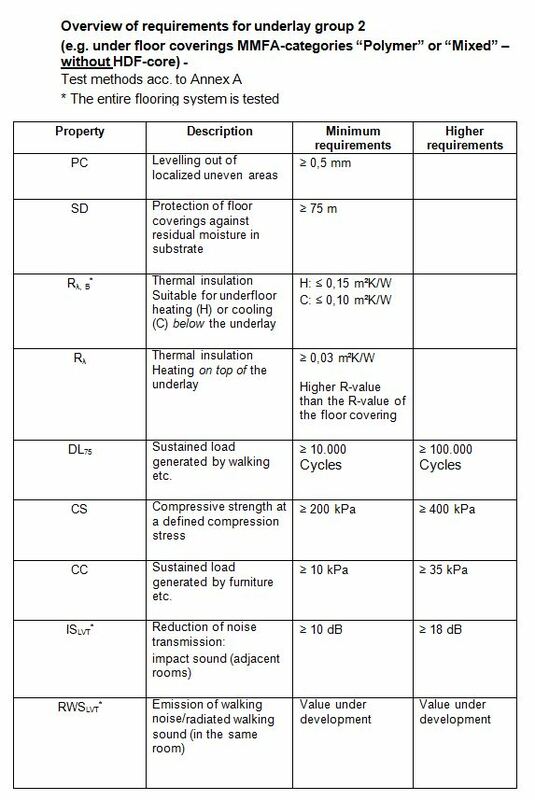 These factors are currently under development to be included in the harmonized standard for floorcoverings EN 14041.